On 28 January 2016, the European Commission released an Anti Tax Avoidance Package, which contains a number of legislative and non-legislative initiatives to help Member States protect their tax bases, create a fair and stable environment for business and preserve EU competitiveness vis-a-vis third countries. The package aims to integrate the recommendations of the recently finalized OECD/G20 Base Erosion and Profit Shifting (BEPS) initiative into EU legislation. New measures will allow coordinated EU action against base erosion and profit shifting and ensure that corporations pay tax where the profits are generated. The implementation of the Anti Tax Avoidance Package is also internationally significant as it will ensure coherent and coordinated transposition of the OECD BEPS recommendations into each Member State. RoyaltyRange closely follows the OECD BEPS and EU Anti Tax Avoidance developments. The data in the RoyaltyRange database is fully compatible with the latest OECD BEPS and EU regulations, where quality, comparability and functional analysis are key. Addressing the risk of double taxation so that companies which pay their fair share of taxes are not penalised for making use of the EU’s internal market. New proposals include measures to block the most common methods used to avoid paying tax, tax treaty abuse prevention, exchange of tax-related information on multinationals operating in the EU between Member States, actions to promote tax good governance internationally and a new, unified list of third countries that refuse to play fair. General Anti-Abuse rule to counter-act aggressive tax planning when other rules do not apply. In light of the Exit Taxation rules, an arm’s length (market) value of the intangibles will be taken into account when taxing the assets transferred to other countries. RoyaltyRange database contains premium quality information on arm’s length intellectual property transferring and licensing arrangements in all industry sectors, and is fully compliant with the upcoming EU regulations. This Recommendation advices the Member States on how to introduce a general anti-abuse rule in their tax treaties in a way that is EU-law compliant and without hampering the freedom of establishment in the Single Market. This measure is directed to counter corporate tax avoidance by the so called “treaty shopping”. Member States are also encouraged to revise their definition of permanent establishment (PE) in line with the wording agreed in BEPS. This measure aims to tackle the current situation, whereby sometimes the weaknesses in the PE definition are exploited to avoid having a taxable presence in one or more countries where they are active. A revision of the Administrative Cooperation Directive will introduce country-by-country reporting between tax authorities on key tax-related information on multinationals. Following this measure, the parent company of a multinational group (or an appointed subsidiary) will have to provide specific information on the whole group to the tax authorities in the Member State where it is resident. The company will also have to identify all countries in which the group is present for tax purposes and the activities carried out in each of them. The report will then be automatically sent to the tax authorities in every Member State where the multinational group is resident or liable for tax. This guidance is in line and follows the OECD BEPS Action 13, which proposes a three-tiered approach to transfer pricing documentation‎: master file, country file and country-by-country report. Country-by-country report will provide information on such entities as R&D or IP holding, whereas master file will provide a detailed list of intangibles or groups of intangibles; list of important agreements related to intangibles, including cost contribution arrangements, principle research service agreements and licence agreements; general description of the group’s transfer pricing policies related to R&D and intangibles; and a description of any important transfers of interests in intangibles, including compensation involved. RoyaltyRange data becomes instrumental to multinationals for implementation, testing and compliance purposes‎. Consistency, reliability and quality are key in this unprecedented compliance and transparency landscape. A new EU screening and listing process which will deal with third countries that refuse to comply with tax good governance standards. It aims to replace the current medley of national lists with a single EU list of third countries. 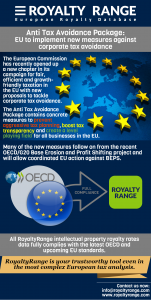 Please contact RoyaltyRange for any assistance and tools with respect to the current and upcoming‎ OECD BEPS and EU Anti Tax Avoidance regulations. You can use this text and infographics with reference to RoyaltyRange website.